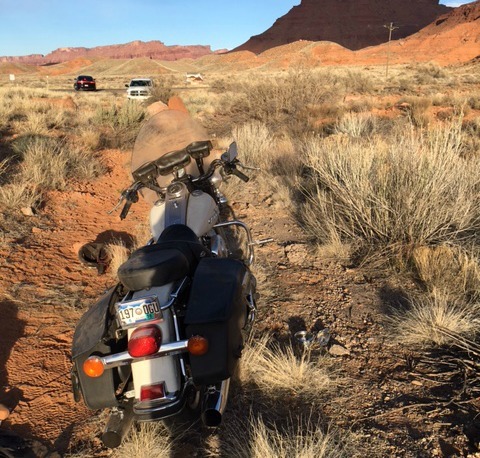 ST. GEORGE — A Colorado man died after his motorcycle left the roadway on State Route 128 in Moab Saturday afternoon; a medical condition may have contributed to his death. A 56-year-old man, later identified as Albert Hughes of Grand Junction, Colorado, was traveling east on SR-128 near mile post 15 and went off the road for an unknown reason, according to the statement issued Sunday by the Utah Highway Patrol. The driver collapsed while speaking with witnesses who pulled to the side after the motorcycle left the road. The rider was unresponsive when medical personnel arrived on scene, and they initiated CPR to resuscitate the man. A medical helicopter was also dispatched to the area to transport Hughes to the hospital, however, he was pronounced dead at 4:30 p.m. while still at the scene. Troopers said that the man was wearing a helmet at the time of the crash and had a previous medical history that may have contributed to his death. In Utah there were more than 1,100 motorcycle crashes in 2015 that resulted in 979 riders injured and 36 killed. Motorcyclists represent 1 percent of persons involved in crashes and yet they account for 13 percent of traffic related deaths, illustrating that motorcycle crashes are nearly 9 times more likely to be fatal than other crashes. According to the latest data available from the Federal Highway Administration, there were 8.6 million motorcycles on U.S. roads in 2015. Of those, nearly 5,000 people were killed in motorcycle crashes, nearly a 9 percent increase from the prior year. In 2014, motorcyclists were 27 times more likely than passenger car occupants to die in a crash per vehicle mile traveled and almost five times more likely to be injured, according to data provided by the National Highway Traffic Safety Administration.